In the Paragon Market, coming in City of Heroes Freedom™, you will be able to purchase new in-game items and account services, manage your game account, and access premium customer support without leaving the game. 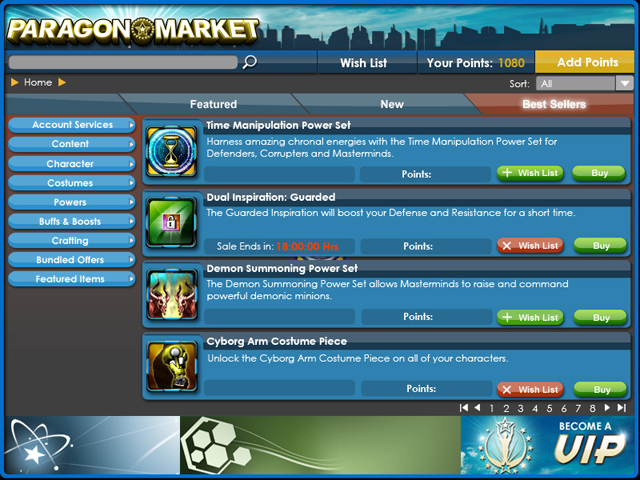 You will access the Paragon Market by clicking on the store icon in the City of Heroes Character Creator or the regular in-game user interface. You pay for items and services in the Paragon Market using Paragon Points™. The anticipated exchange rate will set 400 Paragon Points at $5.00 USD, though this may change before City of Heroes Freedom launches. The Paragon Market will offer bonuses for purchasing Paragon Points in some increments. *Pricing may change by launch. US dollar equivalents are approximate and may change. **VIP players receive access to all signature story free as part of a subscription. ***VIP players receive one free character transfer each month as part of a subscription. Here are some of the new in-game items and account services coming in the Paragon Market. Dual and Team Inspirations. Dual Inspirations combine the power of two Inspirations into one and last longer than a standard Inspiration. Most Team Inspirations grant an Inspiration's benefits to your entire team; though Resurrection Team Inspirations resurrect your character or a single other character. Dual and Team Inspirations are character specific, but they can be redeemed by any character in your account. Two More Enhancement Trays. You can add one or two more Enhancement trays, letting you store up to 20 more Enhancements on each character. The new Enhancement trays are accountwide. Five More Costume Slots. Your characters can have a maximum of 10 costume slots (including the default first costume slot). These costume slots are accountwide and apply to all new and existing characters. You will not be able to unlock the five new costume slots through in-game missions. Twelve More Character Slots. VIP players will be able to purchase 12 more character slots on each server, to maximum of 48 character slots per server. These additional 12 character slots can only be purchased by VIP players. Free and premium players will be able to purchase or unlock up to 36 character slots per server.